Home / Opinion and Issues/ Disasters one after the other – A serious threat to the economy of the nation! Disasters one after the other – A serious threat to the economy of the nation! The month of September in 2018 was a month of disasters all around the world. In many countries, the month of October is also disaster dubious with many hurricanes on its way, aftershocks are predicted, heatwaves are on the roar, and unusual storms are forecasted. Sri Lanka is right on the hotspot. A recent World Bank report highlighted that around 17% of the Sri Lankan population is living in the ‘severe’ heat wave hotspots, while 70% is living in ‘moderate’ hotspot conditions. While the country is (believed to be) far from earthquake fault-lines and zones, the entire island is highly threatened by the Indian Ocean tsunami and large scale tropical cyclones at any time. That being another historical event since 2004, if it happens again, we have more to worry in our day to day life – floods, droughts, landslides, and cyclones. This is a sad story that no single piece of land in the island seems to be safe from at least one of these extreme climate hotspots, be it a slow onset or rapid triggered disaster event. Over the past decades, number of disaster events across the world have devastated many communities. According to the Centre for Research on the Epidemiology of Disasters (CRED), over 600,000 people died, 4.1 billion people were injured, or became homeless and needed emergency assistance over the last two decades due to natural disasters. A recent trend is observed that the substantial investments in economy and social infrastructure, are increasingly damaged by disasters. CRED in its 2017 annual disaster statistical review highlighted that there were fewer natural disasters, deaths, and total people affected in 2017, however with the higher economic losses – almost 50% increase, compared to the previous decade (2007-2016). 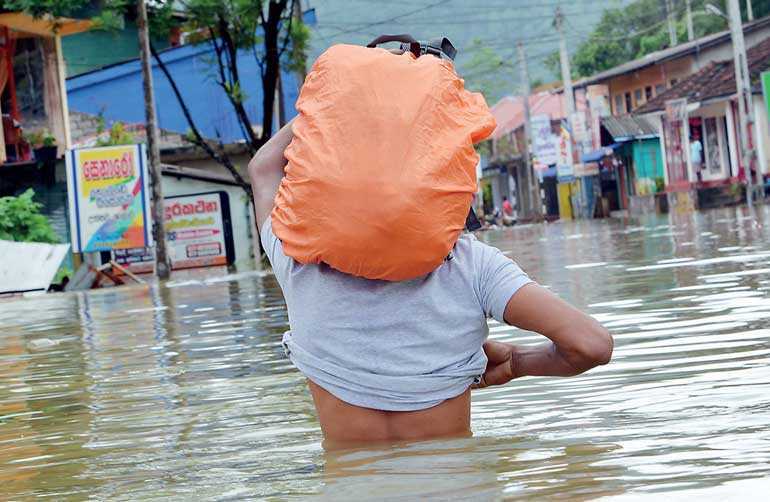 The floods and landslides in May 2017 alone affected 15 of the 25 districts of Sri Lanka, which lead to 203 deaths and 96 people missing, more than 9,000 houses destroyed or damaged and 75,000 people displaced. The Post Disaster Needs Assessment Report highlighted that the cost of 2017 floods and landslides (damages and losses) sum up to Rs. 70 billion, affecting the key sectors such as housing, agriculture, transport and industry and commerce. Sri Lanka is part of the global picture where the most populous Asian continent has endured the large portion of the impacts due to disasters in the past 20 years. Asian continent has recorded 85% of all affected people, 78% of reported economic damage, 62% of all disaster occurrences, and 69% of deaths. While this emphasises the regional and global approach to combat extreme climate events, the local actions are the key that can make a larger positive impact on the population vulnerable for emerging disaster and climate risks. The risk-sensitive development approach should become the heart of the community resilient building and sustainable development interventions, and driving vehicle for the policy-makers at local and national level. The role of local authorities in disaster risk reduction is far behind, who hardly have attempted to mobilise required resources well in advance for emerging disaster threats. The Municipalities and Urban Councils across the country have their own struggles to address day to day problems accumulating to larger crisis such as waste management and environmental protection. The recent earthquake and subsequent tsunami in Sulawesi, Indonesia reminded the world again the need for innovative new technologies for effective early warning systems and quicker response strategies. The resilience to disasters needs to be built-in within the social systems and processes, by developing new disaster and climate risk-sensitive development projects. It is also important to integrate as part of our routine work in all sectors and to make state, private, and civil society mechanisms to come together collectively to address the gaps effectively. The high rates of population growth, and natural resource degradation, with continuing high rates of poverty and food insecurity make South Asia one of the most vulnerable regions to the impacts of climate change. The 2015-2030 Sendai Framework has set seven global targets and four priorities for actions. The four priority actions include: understanding disaster risk, strengthening disaster risk governance, investing in disaster risk reduction for resilience, and enhancing disaster preparedness for effective response. We encroached flood plains, coastlines, dry lands and other high-risk areas, which increases our exposure to natural hazards which becomes a complex humanitarian catastrophe. In Sri Lanka, we can’t forget other silent killers making the news headlines everyday in our media – many death due to road accidents every hour of the day, elephant conflict with socio-ecological systems, and deaths due to chronic kidney diseases. These enduring disaster events may have already surpassed the records of deaths due to three decades of war in our motherland ended in 2009. We may make our cities non-liveable to our next generation if we do not proactively address the root causes of these problems now. We seem to have built a sense of ‘not of my business’ culture to care for environment in our daily activities. On the other hand, political representatives elected to the local authorities fail to give greater attention to address the social and environmental problems happening around their electoral wards. Similarly, therein, our local authorities have failed to enforce the rigid laws and legal actions against the perpetrators, because sometimes the law enforcement entities and policy-makers are part of the problem and are the problems. The 13th of October is the day declared as an International Day for Disaster Risk Reduction. The World Tsunami Awareness Day is next to come on 5 November, which was first introduced in 2016. The National Safety Day follows on 26 December to remember the 2004 tsunami disaster that claimed over 200,000 lives in 12 countries, including Sri Lanka. ‘Do we do enough with remembering these days to prepare for the emerging disaster and climate risks?’ is a question every citizen needs to ask. We can talk, write, and debate. 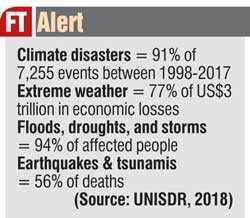 Yet, a lot to be done on the ground by the people the most, to have some sense in what we do to be disaster and climate risk-sensitive, thinking twice before embarking any small action in our socio-ecological systems can make a huge difference and saves thousands of lives. We are yet to vision liveable cities and villages for the future of our children and the next generation of young people. Yes, the culture of politics is to blame, and we as responsible citizens of this island are also to be blamed for our irresponsiveness to elect the right representatives to make the right policy in the right time. We disturb nature by an inch and nature disturbs us by many hundreds of feet, and we are not capable of coping with its returns. Let us start small; from our own homes, from our own children, from our own schools and offices, and from wherever we interact with the environment, by educating ourselves to inherit a culture of disaster prevention and innovative actions for reducing disaster risk creation – this is the thought for the day.